In October 539, the Persian king Cyrus took Babylon, the ancient capital of an oriental monarchy covering modern Iraq, Syria, Lebanon, and Israel. In a broader sense, Babylon was the ancient world's capital of scholarship and science. The subject provinces soon recognized Cyrus as their legitimate ruler. Since he already was lord of peripheral regions in modern Turkey and Iran (and Afghanistan? ), we are allowed to say that the capture of Babylon meant the birth of a true world empire. The Persian Empire was to last for more than two centuries, until it was divided by the successors of the Macedonian king Alexander the Great. A remarkable aspect of the capture of Babylon is the fact that Cyrus allowed the Jews (who were exiled in Babylonia) to return home. The Chronicle of Nabonidus gives contemporary information about the rise of Cyrus and the strange behavior of Nabonidus, who leaves Babylon and spends several years in the oasis Temâ in Arabia. His son Bêlsharusur (the biblical Belshazzar) acts as regent but is unable to ward off the approaching Persian danger. Finally, Nabonidus returns and fights. But it is in vain; Cyrus is welcomed as representative of the supreme god. The Verse account of Nabonidus is a poem by one of the priests of the Esagila, the temple of the Babylonian supreme god Marduk. It shows that they were upset because the important New Year's festival had not been celebrated in the king's absence. The author of this libel does little to hide his contempt for the impious madman. The prophet Daniel tells a story about the madness of another king of Babylonia, Nebuchadnezzar. There are several details in this story that make it plausible that the original story was about Nabonidus. Reconstruction of this original is possible through comparsion with the Prayer of Nabonidus. The text known as the Cyrus Cylinder does not care about the reason for Nabonidus' behavior. The new king presents himself -according to the priest who wrote this text- as the one chosen by the supreme god to liberate Babylon from tyranny. We may speculate that Cyrus considered himself to be on a divine mission, under guidance of the Persian supreme god Ahuramazda; the Babylonian clerk who wrote down this text calls the god who had lead Cyrus to victory Marduk. Cyrus also boasts that he has liberated many people who were exiled to Babylon. The Jewish prophet known as Second Isaiah tells more or less the same story: Cyrus is chosen by a supreme god (the God of the Jews, in his view) and after winning a victory, he allows the Jews to go back home. The prophet Ezra gives us the -maybe authentic- text of Cyrus' decree on the exiled Jews. The Greek historian Herodotus, finally, has a very unreliable story about the Fall of Babylon. The so-called Chronicle of Nabonidus tells us the story of the rule of the last king of independent Babylonia. The text is badly damaged and contains many lacunas. However, it makes clear that the rise of Cyrus was not unexpected: we meet him for the first time in Nabonidus' sixth year (=550 BCE), when Cyrus defeats the Median king Astyages. A second mentioning can be found in year nine, when he defeats the king of a country that is probably to be identified with Lydia (547 BCE). In addition, we learn that Nabonidus was not present in Babylon for ten years. He seems to have tried to subject Arabia: in year three he took the important town Adummu, which controls the direct road from Babylon to the Gulf of Aqaba. From year seven till year sixteen, Nabonidus stayed in the oasis of Temâ in the Arabian desert, from where he could easily go as far south as Iatribu (modern Medina). The events of year seventeen look rather desperate: although the New Year's festival can now be celebrated, several divine guests fail to attend - suggesting that their home towns were under siege. We also learn about a short invasion by soldiers from the Sea Land. Throughout this text, "Akkad" means Babylonia. Accession year (556 BCE): ... he lifted. The king brought their [lacuna] to Babylon. Third year (553): In the month of Abu, to the Amananus, the mountains of [many?] fruit trees. All kinds of fruits he sent to Babylon. The king fell sick, but he recovered. In the month Kislimu, the king called up his army and [joined forces with king?] Nabu[lacuna] of Amurru and marched to [lacuna]. Against the town Adummu they pitched camp [lacuna] the town Shindini [lacuna] he killed him. Seventh year (549): The king stayed in Temâ; the crown prince, his officials and his army were in Akkad. The king did not come to Babylon for the [New Year's] ceremonies of the month of Nisanu; the image of the god Nabu did not come to Babylon, the image of the god Bêl [= Marduk] did not go out of Esagila in procession, the festival of the New Year was omitted. But the offerings within the temples Esagila and Ezida were given according to the complete ritual; the urigallu-priest made the libation and asperged the temple. Ninth year (547): Nabonidus, the king stayed in Temâ; the crown prince, his officials and his army were in Akkad. The king did not come to Babylon for the ceremony of the month of Nisanu; the god Nabu did not come to Babylon, the god Bêl did not go out of Esagila in procession, the festival of the New Year was omitted. But the offerings within the temples Esagila and Ezida for the gods of Babylon and Borsippa were given according to the complete ritual. In the month of Nisanu the fifth day, the mother of the king died in the Walled Camp, which is on the banks of the Euphrates, above Sippar. The crown prince and his army were in deep mourning for three days, an official weeping was performed. In Akkad, an official weeping on behalf of the mother of the king was performed in the month of Simanu. In the month of Nisanu, Cyrus, king of Persia, called up his army and crossed the Tigris below the town of Arbela. In the month of Aiaru he marched against the country Ly[lacuna; possibly Lydia], killed its king, took his possessions, put there a garrison of his own. Afterwards, his garrison as well as the king remained there. Tenth year (546): The king stayed in Temâ; the crown prince, his officials and his army were in Akkad. The king did not come to Babylon for the ceremonies of the month of Nisanu; Nabu did not come to Babylon, Bêl did not go out of Esagila in procession, the festival of the New Year was omitted. But the offerings within the temples Esagila and Ezida for the gods of Babylon and Borsippa were given according to the complete ritual. Eleventh year (545): The king stayed in Temâ; the crown prince, his officials and his army were in Akkad. The king did not come to Babylon for the ceremonies of the month of Nisanu; Nabu did not come to Babylon, Bêl did not go out of Esagila in procession, the festival of the New Year was omitted. But the offerings within the temples Esagila and Ezida for the gods of Babylon and Borsippa were given according to the complete ritual. ... Tigris. In the month of Addaru the image of Ishtar of Uruk [lacuna] The army of the Persians made an attack. Seventeenth year (539): Nabu went from Borsippa for the procession of Bêl [lacuna] The king entered the temple of Eturkalamma; in the temple he [lacuna]. The Sea Country made a short invasion. Bêl went out in procession. They performed the festival of the New Year according to the complete ritual [April, 4]. In the month of [Abu?] Lugal-Marada and the other gods of the town Marad, Zabada and the other gods of Kish, the goddess Ninlil and the other gods of Hursagkalama visited Babylon. Till the end of the month Ululu all the gods of Akkad -those from above and those from below- entered Babylon. The gods of Borsippa, Kutha, and Sippar did not enter. In the month of Tashritu, when Cyrus attacked the army of Akkad in Opis [i.e., Baghdad] on the Tigris, the inhabitants of Akkad revolted, but Nabonidus massacred the confused inhabitants. The fifteenth day [October 12], Sippar was seized without battle. Nabonidus fled. The sixteenth day, Gobryas[litt: Ugbaru], the governor of Gutium, and the army of Cyrus entered Babylon without battle. Afterwards, Nabonidus was arrested in Babylon when he returned there. Till the end of the month, the shield carrying Gutians were staying within Esagila but nobody carried arms in Esagila and its buildings. The correct time for a ceremony was not missed. In the month of Arashamnu, the third day [October 30], Cyrus entered Babylon, green twigs were spread in front of him - the state of peace was imposed upon the city. Cyrus sent greetings to all Babylon. Gobryas, his governor, installed subgovernors in Babylon. From the month of Kislimu to the month of Addaru, the gods of Akkad which Nabonidus had made come down to Babylon, were returned to their sacred cities. In the month of Arashamnu, on the night of the eleventh, Gobryas died [March 4]. In the month of Arashamnu, the [lacuna] day, the wife of the king died. From the twenty-seventh day of Arashamnu till the third day of Nisanu [March 20-26], an official weeping was performed in Akkad. All the people went around with their hair disheveled. When, the fourth day [March 27] Cambyses, son of Cyrus, went to the temple of [unintelligible], the epa-priest of Nabu who [lacuna] the bull [lacuna] They came and made the weaving by means of the handles and when he led the image of Nabu [lacuna] spears and leather quivers, from [lacuna] Nabu returned to Esagila, sheep offerings in front of Bêl and the god Mârbîti. The question what Nabonidus was doing in Temâ will probably remain unsolved for ever. From the following text, we may deduce that during his life time, there were strong rumors that the king suffered from a mental illness and proposed a religious reform ( preferring the Moon to all other gods). These rumors were used by the author of the Verse account to explain Nabonidus' stay abroad: being mad, he ignored Marduk and went away. We will discuss the truth of the allegations below. Nabonidus' devotion to the Moon is a historical fact, proven by an inscription found in Harran (in 1956). That he blasphemed against Marduk, however, may be an exaggeration. [As to Nabonidus?] law and order are not promulgated by him, he made perish the common people through want, the nobles he killed in war, for the trader he blocked the road. Their faces became hostile, they do not parade along the wide street, you do not see happiness anymore, [lacuna] is unpleasant, they decided. its appearance is that of the eclipses moon, the gesture of its hand is like that of the god Lugal-[unintelligible], its head of hair reaches to the pedestal, and in front of it are placed the Storm Dragon and the Wild Bull. When he worshipped it, its appearance became like that of a demon crowned with a tiara, his face turned hostile [lacuna]. [lacuna] His form not even Eamummu could have formed, not even the learned Adapa knows his name. Nabonidus said: "I shall build a temple for him, I shall construct his holy seat, I shall form its first brick for him, I shall establish firmly its foundation, I shall make a replica even to the temple Ekur. I shall call its name Ehulhul for all days to come. When I will have fully executed what I have planned, I shall lead him by the hand and establish him on his seat. Yet till I have achieved this, till I have obtained what is my desire, I shall omit all festivals, I shall order even the New Year's festival to cease!" And he formed its first brick, did lay out the outlines, he spread out the foundation, made high its summit, by means of wall decoration made of gypsum and bitumen he made its facing brilliant, as in the temple Esagila he made a ferocious wild bull stand on guard in front of it. After he had obtained what he desired, a work of utter deceit, had built this abomination, a work of unholiness -when the third year was about to begin- he entrusted the army [?] to his oldest son, his first born, the troops in the country he ordered under his command. He let everything go, entrusted the kingship to him, and, himself, he started out for a long journey. The military forces of Akkad marching with him, he turned to Temâ deep in the west. He started out the expedition on a path leading to a distant region. When he arrived there, he killed in battle the prince of Temâ, slaughtered the flocks of those who dwell in the city as well as in the countryside. And he, himself, took residence in Temâ, the forces of Akkad were also stationed there. He made the town beautiful, built there a palace like the palace in Babylon. He also built walls for the fortification of the town and he surrounded the town with sentinels. ... the praise of the Lord of Lords and the names of the countries which Cyrus has not conquered he wrote upon this stela, while Cyrus is the king of the world whose triumphs are true and whose yoke the kings of all the countries are pulling. Nabonidus has written upon his stone tablets: "I have made him bow to my feet, I personally have conquered his countries, his possessions I took to my residence." It was he who once stood up in the assembly to praise himself, saying: "I am wise, I know, I have seen what is hidden. Even if I do not know how to write with the stylus, yet I have seen secret things. The god Ilte'ri has made me see a vision, he has shown me everything. I am aware of a wisdom which greatly surpasses even that of the series of insights which Adapa has composed!" When he saw the usar-symbol of Esagila, he makes an [insulting?] gesture. He assembled the priestly scholars, he expounded to them as follows: "Is not this the sign of ownership indicating for whom the temple was built? If it belongs really to Bêl, it would have been marked with the spade. Therefore the Moon himself has marked already his own temple with the usar-symbol!" And Zeria, the šatammu-official who used to crouch as his secretary in front of him, and Rimut, the bookkeeper who used to have his court position near to him, do confirm the royal dictum, stand by his words, they even bare their heads to pronounce under oath: "Now only we understand this situation, after the king has explained about it!" [lacuna] for the inhabitants of Babylon, Cyrus declared the state of peace. His troops he kept away from Ekur. Big cattle he slaughtered with the axe, he slaughtered many aslu-sheep, incense he put on the censer, the regular offerings for the Lord of Lords he ordered increased, he constantly prayed to the gods, prostrated on his face. To act righteously is dear to his heart. To the inhabitants of Babylon a joyful heart is now given. They are like prisoners when the prisons are opened. Liberty is restored to those who were surrounded by oppression. All rejoice to look upon him as king! The final redaction of the biblical book of Daniel (called after a Jewish sage at the court of Belshazzar, i.e. Nabonidus' crown prince Bêlsharusur) took place in the second century BCE, but it contains older elements. Probably, no less than four authors have contributed to the text. The resulting text can not be taken as history. Too many elements are too incredible (about every name is wrong). However, chapter four contains a bit of information that is corroborated by the Prayer of Nabonidus. According to Daniel's story, the Babylonian king Nebuchadnezzar suffers from a mental illness, and lives isolated for seven years, until he acknowledges the power of the one God. From cuneiform texts, nothing is known about Nebuchadnezzar's mental health. The original story must have centered on another royal patient: Nabonidus, about whom rumors like this did circulate (see the Verse account). Moreover, several details return in the Prayer, where Nabonidus is the sad hero: the period of seven years, the isolation, the ultimate recognition of the power of the supreme God. Since the authors of Daniel consistently avoid mentioning Nabonidus, it is likely that one of them is responsible for the change of names. This means that two elements of the Verse account are corroborated: the madness of Nabonidus and his monotheistic attitude. Stated differently, we have two sources for the accusations - a Babylonian poem full of insults and a Jewish story. 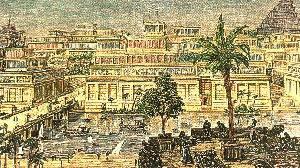 (4.29) At the end of the twelve months Nebuchadnezzar was walking about the royal palace of Babylon. (4.30) The king spoke, saying, "Is not this great Babylon, that I have built for a royal dwelling by my mighty power and for the honor of my majesty?" (4.31) While the word was still in the king's mouth, a voice fell from heaven: "King Nebuchadnezzar, to you it is spoken: 'The kingdom has departed from you!' (4.32) And they shall drive you from men, and your dwelling shall be with the beasts of the field. They shall make you eat grass like oxen; and seven years shall pass over you, until you know that the Most High rules in the kingdom of men, and gives it to whomever He chooses." (4.33) That very hour the word was fulfilled concerning Nebuchadnezzar; he was driven from men and ate grass like oxen; his body was wet with the dew of heaven till his hair had grown like eagles' feathers and his nails like birds' claws. (4.34) And at the end of the time I, Nebuchadnezzar, lifted my eyes to heaven, and my understanding returned to me; and I blessed the Most High and praised and honored Him Who lives forever: for His dominion is an everlasting dominion, and His kingdom is from generation to generation. (4.35 ) All the inhabitants of the earth are reputed as nothing; He does according to His will in the army of heaven and among the inhabitants of the earth. No one can restrain His hand or say to Him, "What have You done?" (4.36) At the same time my reason returned to me, and for the glory of my kingdom, my honor and splendor returned to me. My counselors and nobles resorted to me, I was restored to my kingdom, and excellent majesty was added to me. (4.37) Now I, Nebuchadnezzar, praise and extol and honor the King of heaven, all of whose works are truth, and His ways justice. And those who walk in pride He is able to put down. This Aramaic text belongs to the famous Dead Sea scrolls: four scraps of parchment from Cave 4, usually called 4Q242, copied from an older original in the second half of the first century BCE. The story is similar to the preceding one: a king of Babylon is ill, lives isolated for seven years and becomes convinced of the truth of the monotheistic creed. There must have been a Jewish story about the mad king Nabonidus who went to Temâ to recover his wits, and recognized the supreme God. Two people reworked this original: one of the authors of Daniel changed the name of the monarch, the author of the Prayer changed the illness (to make the story fit Leviticus 13??). The reconstructed story independently confirms two points made by the author of the Verse account: Nabonidus suffered from a mental disease and insulted the Babylonian clergy by his monotheistic ideas . In this text -a damaged clay cylinder now in the British Museum- Cyrus describes how he conquers the old city. Nabonidus is considered a tyrant with strange religious ideas, which causes the god Marduk to intervene. That Cyrus thought of himself as chosen by a supreme god, is confirmed by Second Isaiah; his claim that he entered the city without struggle corroborates the same statement in the Chronicle of Nabonidus (above). ... the four rims of the world [lacuna]. A weakling was installed as the king of his country; the correct images of the gods were removed from their thrones, imitations were ordered to place upon them. A replica of the temple Esagila he had [lacuna]. For Ur and the other sacred cities inappropriate rituals [were ordered?]. Daily he did blabber incorrect prayers. He furthermore interrupted in a fiendish way the regular offerings, he did [lacuna] established within the sacred cities. The worship of Marduk, the king of the gods, he changed into abomination, daily he used to do evil against Marduk's city [lacuna]. He tormented its inhabitants with corvée-work without relief, he ruined all. Upon their complaints the lord of the gods became terribly angry and he departed from their region, also the other gods living among them left their mansions, wroth that he had brought then into Babylon. But Marduk who does care for [his people?] on account of the fact that the sanctuaries of all their settlements were in ruins and the inhabitants of Sumer and Akkad had become like living dead, turned back his countenance. His anger abated and he had mercy upon them. He scanned and looked through all the countries, searching for a righteous ruler willing to lead Marduk in the annual procession. Then he pronounced the name of Cyrus, king of Anshan [i.e., Persia], declared to become the ruler of all the world. He made the Guti country and all the Manda-hordes [i.e., the Medians] bow in submission to Cyrus' feet. And Cyrus did always endeavor to treat according to justice the people whom Marduk has made him conquer. Marduk, the great lord, a protector if his people, beheld with pleasure Cyrus' good deeds and his upright mind and therefore ordered him to march against his city Babylon. He made him set out on the road to Babylon going at his side like a real friend. Cyrus' widespread troops -their number, like that of the water of a river, could not be established- strolled along, their weapons packed away. Without any battle, he made him enter his own town Babylon, sparing Babylon any calamity. He delivered into Cyrus' hands Nabonidus, the king who did not worship him. All the inhabitants of Babylon as well as of the entire country of Sumer and Akkad [i.e., the surrounding provinces], princes and governors included, bowed to Cyrus and kissed his feet, jubilant that he had received the kingship, and with shining faces. Happily they greeted him as a master through whose help they had come again to life from death and had all been spared damage and disaster, and they worshipped his very name. I am Cyrus, king of the world, great king, legitimate king, king of Babylon, king of Sumer and Akkad, king of the four rims of the earth, son of Cambyses, great king, king of Anshan, grandson of Cyrus, great king, king of Anshan, descendant of Teispes, great king, king of Anshan, of a family which always exercised kingship, whose rule [the gods] Bêl and Nabu love, whom they want as king to please their hearts. When I entered Babylon as a friend and when I established the seat of the government in the palace of the ruler under jubilation and rejoicing, Marduk, the great lord, induced the magnanimous inhabitants of Babylon to love me, and I was daily endeavoring to worship him. My numerous troops walked around in Babylon in peace, I did not allow anybody to terrorize any place of the country of Sumer and Akkad. I strove for peace in Babylon and in all his other sacred cities. As to the inhabitants of Babylon who against the will of the gods were [enslaved? ], I abolished the corvée which was against their social standing. I brought relief to their dilapidated housing, putting thus an end to their main complaints. Marduk, the great lord, was well pleased with my deeds and sent friendly blessings to myself, Cyrus, the king who worships him, to Cambyses, my son, the offspring of my loins, as well as to all my troops, and we all praised his great godhead joyously, standing before him in peace. All the kings of the entire world from the Upper to the Lower Sea [i.e., from the Mediterranean Sea to the Persian Gulf], those who are seated in throne rooms, those who live in other types of buildings as well as all the kings of the West land living in tents, brought their heavy tributes and kissed my feet in Babylon. As to the region from [lacuna] as far as Aššur and Susa, Agade, Eshnunna, the towns of Zamban, Me-Turnu, Der as well as the region of the Gutians, I returned to these sanctuaries on the other side of the Tigris, the sanctuaries of which had been ruins for a long time, the images which used to live therein and established for them permanent sanctuaries. I also gathered all their former inhabitants and returned to them their habitations. Furthermore, I resettled upon the command of Marduk, the great lord, all the gods of Sumer and Akkad whom Nabonidus had brought into Babylon to the anger of the lord of the gods, unharmed, in their former chapels, the places which make them happy. "Second Isaiah" is the name of the chapters 40-55 of the book of Isaiah, which were a later addition to an older text. The second prophet predicts the coming of king Cyrus, who will liberate the Jews from their Babylonian Exile and will bring them to the Promised Land. It may be noted that Cyrus was considered by the Jews a monotheist, an opinion that was more or less correct, since many Persians venerated the "wise lord" Ahuramazda who was the eternal enemy of an evil god named Ahriman. Persian religion also stressed that people should be honest and righteous, and it is possible that these ideas about a wise Lord with an ethical message influenced the two last lines quoted below. This Jewish text confirms Cyrus' own propaganda, that he was chosen by the supreme god to liberate Babylon. "I am the Lord, who makes all things, Who stretches out the heavens all alone, Who spreads abroad the earth by Myself; (44.25) Who frustrates the signs of the babblers, and drives diviners mad, who turns wise men backward, and makes their knowledge foolishness, (44.26) Who confirms the word of His servant, and performs the counsel of His messengers, Who says to Jerusalem, 'You shall be inhabited,' to the cities of Judah, 'You shall be built,' and will raise up her waste places, (44.27) Who says to the deep, 'Be dry!' and will dry up your rivers, (44.28) Who says of Cyrus, 'He is My shepherd, And he shall perform all My pleasure, saying to Jerusalem, "You shall be built," and to the temple, "Your foundation shall be laid."'" (45.2) "I will go before you and make the crooked places straight; I will break in pieces the gates of bronze and cut the bars of iron. (45.3) I will give you the treasures of darkness and hidden riches of secret places, so that you may know that I, the Lord, Who call you by your name, am the God of Israel. (45.4) For Jacob My servant's sake, and Israel My elect, I have even called you by your name; I have named you, though you have not known Me. (45.5) I am the Lord, and there is no other; there is no God besides Me. I will gird you, though you have not known Me, (45.6) that they may know from the rising of the sun to its setting that there is none besides Me. I am the Lord, and there is no other; (45.7) I form the light and create darkness, I make peace and create calamity; I, the Lord, do all these things. (45.8) Rain down, you heavens, from above, and let the skies pour down righteousness; let the earth open, let them bring forth salvation, and let righteousness spring up together. I, the Lord, have created it." The following lines in the book of Ezra refer to a decree by Cyrus. It is unclear whether this is the true wording of the decree, but it may be authentic: no Jew would have called "the God of Israel" "the God who is in Jerusalem", since He was everywhere. We may compare the decree to Cyrus' own statement that he gathered many people and returned them to their former habitations (above). The prophesy of Jeremiah that is referred to, is Jeremiah 25.11-12, where it is stated that the Jews would return after seventy years. In fact, the Babylonian Exile lasted from 587 -when the Babylonian king Nebuchadnezzar had captured Jerusalem- until 539. (1.2) "This is what Cyrus king of Persia says: The Lord, the God of Heaven, has given me all the kingdoms of the earth and has appointed me to build a temple for him at Jerusalem in Judah. (1.3) Anyone of his people among you - may his God be with him, and let him go up to Jerusalem in Judah and build the temple of the Lord, the God of Israel, the God who is in Jerusalem. (1.4) And the people of any place where they may still be living are to provide them with silver and gold, with goods and livestock, and with freewill offerings for the temple of God in Jerusalem." (1.5) Then the family heads of Judah and Benjamin, and the priests and Levites -everyone whose heart God had moved- prepared to go up and build the house of the Lord in Jerusalem. (1.6) All their neighbors assisted them with articles of silver and gold, with goods and livestock, and with valuable gifts, in addition to all the freewill offerings. (1.7) Moreover, king Cyrus brought out the articles belonging to the temple of the Lord, which Nebuchadnezzar had carried away from Jerusalem and had placed in the temple of his god [i.e., Marduk]. (1.8) Cyrus king of Persia had them brought by Mithredath the treasurer, who counted them out Sheshbazzar the prince of Judah. The Histories by the Greek researcher Herodotus of Halicarnassus (fifth century BCE) are the world's first historical study. The account of the Fall of Babylon -which is presented in the translation by George Rawlinson- proofs beyond all reasonable doubt that the author never spoke a Babylonian about the event. Only two details he has right: that Cyrus entered Babylonia at Opis, where a battle was fought, and that he finally took the ancient city. (1.189) Cyrus on his way to Babylon came to the banks of the Gyndes, a stream which, rising in the Matienian mountains, runs through the country of the Dardanians, and empties itself into the river Tigris. The Tigris, after receiving the Gyndes, flows on by the city of Opis [i.e, Baghdad], and discharges its waters into the Erythraean sea [i.e, the Persian Gulf]. When Cyrus reached this stream, which could only be passed in boats, one of the sacred white horses accompanying his march, full of spirit and high mettle, walked into the water, and tried to cross by himself; but the current seized him, swept him along with it, and drowned him in its depths. Cyrus, enraged at the insolence of the river, threatened so to break its strength that in future even women should cross it easily without wetting their knees. Accordingly he put off for a time his attack on Babylon, and, dividing his army into two parts, he marked out by ropes one hundred and eighty trenches on each side of the Gyndes, leading off from it in all directions, and setting his army to dig, some on one side of the river, some on the other, he accomplished his threat by the aid of so great a number of hands, but not without losing thereby the whole summer season. (1.190) Having, however, thus wreaked his vengeance on the Gyndes, by dispersing it through three hundred and sixty channels, Cyrus, with the first approach of the ensuing spring, marched forward against Babylon. The Babylonians, encamped without their walls, awaited his coming. A battle was fought at a short distance from the city, in which the Babylonians were defeated by the Persian king, whereupon they withdrew within their defenses. Here they shut themselves up, and made light of his siege, having laid in a store of provisions for many years in preparation against this attack; for when they saw Cyrus conquering nation after nation, they were convinced that he would never stop, and that their turn would come at last. (1.191) Cyrus was now reduced to great perplexity, as time went on and he made no progress against the place. In this distress either some one made the suggestion to him, or he bethought himself of a plan, which he proceeded to put in execution. He placed a portion of his army at the point where the river enters the city, and another body at the back of the place where it issues forth, with orders to march into the town by the bed of the stream, as soon as the water became shallow enough: he then himself drew off with the unwarlike portion of his host, and made for the place where [former queen] Nitocris dug the basin for the river, where he did exactly what she had done formerly: he turned the Euphrates by a canal into the basin, which was then a marsh, on which the river sank to such an extent that the natural bed of the stream became fordable. Hereupon the Persians who had been left for the purpose at Babylon by the, river-side, entered the stream, which had now sunk so as to reach about midway up a man's thigh, and thus got into the town. Had the Babylonians been apprised of what Cyrus was about, or had they noticed their danger, they would never have allowed the Persians to enter the city, but would have destroyed them utterly; for they would have made fast all the street gates which gave upon the river, and mounting upon the walls along both sides of the stream, would so have caught the enemy, as it were, in a trap. But, as it was, the Persians came upon them by surprise and so took the city. Owing to the vast size of the place, the inhabitants of the central parts (as the residents at Babylon declare) long after the outer portions of the town were taken, knew nothing of what had chanced, but as they were engaged in a festival, continued dancing and reveling until they learnt the capture but too certainly. Such, then, were the circumstances of the first taking of Babylon.